Well, silver is an element when you get down to it. Ag. Number 47 on the periodic chart. Remember that? Sterling silver on the other hand, is 925 parts out of a thousand fine silver and 75 parts copper (another element!). Fine silver is 999.9 parts pure silver, it is also much softer and more resistant to tarnish than sterling silver. Will Silver Turn My Skin Green? NO! (*) When silver rings turn a finger green it is often because they were plated with silver and the plating has worn off to expose a copper base to your skin. Copper will turn skin green. If you have a piece of MINE that is turning your skin green - I apologize, I do my final buffing using a green water-soluble rouge and sometimes despite the scrubbing I'll give it, it doesn't all get washed off when I clean the piece afterwards. SO no worries if you're seeing green, just give your hands a good washing and that compound should wash away fairly quickly. Rest assured, it's solid sterling! * On rare occasions, some people are so sensitive to the copper content in sterling that they will experience green skin, however this only happens to a very small percentage of people. Will Silver Turn My Skin Black? Not usually. But if you're allergic sometimes this could happen (or you could even break out in a rash). If you are wearing silver and it is turning your skin black, it doesn't necessarily mean it's not silver. Silver will react differently with different people's body chemistry. Some people find that they often turn the silver itself black when it touches their skin. Others will have their skin turn black where it is touching the silver. Often this happens with rings. I personally have had silver rings leave black marks on my fingers on hot hot days when I've been sweating a lot. It isn't a sign of inferior metal, it's just basic chemistry between you and the metal. The best thing to do in this situation is keep your jewellery, and your skin as clean as possible. If you're one of the unfortunate souls who this occurs to all the time, then I guess silver just isn't your metal. Sometimes as well plated pieces, or pieces with nickel will turn your skin black. Nickel allergies are often accompanied with a rash or itching. NOTE: Gold can also turn skin black. This is the case with me and 14K gold rings. My fingers will get a black ring underneath the ring especially if my hands aren't clean and dry. SILVER AND POOLS AND HOT TUBS! DON'T DO IT! Take your silver jewellery off! Chemicals in pools and hot tubs often react with silver. They can potentially do more than tarnish, they can patina your jewellery black. This cannot usually be cleaned off, but will likely require a go under the polishing wheel. You also run the risk of potentially losing your jewellery in the water as we often do not feel it slide off our fingers etc, while swimming. So do yourself a favour and keep your jewellery at home if you know you'll be swimming! The most standard patina I apply to sterling silver is Liver of Sulphur. I refer to this as "antiquing". The liver of sulfur oxidizes the silver, turning it dark. This is a permanent treatment. The piece is usually buffed after patination process to bring out the bright silver on the raised areas in the piece. I find this is an excellent method for creating contrast in my pieces and use it often. If your piece has been given a patina, it requires special care and should not be cleaned in a silver dip, as these dips can be extremely harsh and may - correction, WILL - strip this finish from the piece. Brushed silver vs. Polished silver. I love polishing and most of my pieces are given a high polish under the polishing wheel. However some pieces final stages involve a steel brush or a satin finish buff. Polished silver is essentially burnished smooth, where brushed silver is a very fine texturing process. These two finishes require different care but the best way to care for both is to clean them AFTER you wear it. That way while it's not being worn there is less of your body oil, dirt, etc on the surface of the jewellery. Clean jewellery won't tarnish as quickly. I've listed some methods of cleaning your silver jewellery below. It happens. Your sterling silver jewellery will tarnish! If properly cared for, your sterling silver jewellery piece can be kept looking fantastic. The key to keeping your jewellery looking fine, is treating it fine. Keep it clean. In fact, cleaning it after wearing it is the best thing you can do. It's all the junk your skin leaves on the jewellery while it's sitting around waiting to be worn again that does the most damage. Like any kind of treatment, prevention is the best kind. I have included an easy at home technique to remove tarnish from silver below! It's how I choose to clean most of my jewellery most of the time. After each session under a polishing/buffing/texturing machine I always take a soft toothbrush with mild soap and warm water to clean out my components. I prefer Sunlight dish soap. It is an excellent de-greaser and gets the oil and dirt out that can often get trapped in a piece. (This is also a great way to clean your diamond rings as well - diamonds are notorious grease magnets! Toothbrush and dish soap and warm water will clean those engagement/ wedding rings right up)! Rinse well after washing and be sure to dry the pieces immediately after washing. Pieces left to air dry may develop lovely little yellow water stains which are hard to get out. The polishing cloth is simply a cloth impregnated with a buffing compound which leaves a protective coating that prolongs the oxidation process. It is great for pieces with a high polish, and especially great for pieces with a patina that have been given a high polish. HOWEVER, I recommend cleaning the piece with soap and water first! It washes away the dirt and oil on the piece first, and that way dirt won't get trapped in the cloth and cause any unwanted scratches when you're shining up your piece! Safety first! Brushed Silver with and without a Patina. Again, soap and warm water with a soft toothbrush. It cleans the oil and the dirt out of the piece and usually that is all you need to do. If you do this every time you finish wearing a piece it'll keep it looking great for a long time. Brushed silver doesn't really appreciate the polishing cloth treatment like high polished silver. The compound from the cloth will build up in brushed texture and make it look icky. Soap and water keeps that texture clean and bright. This is also safe for patinas. Brushed silver alone can be touched up with any type of abrasive pad (you can find these in hardware stores) - this will revive a brushed finish that has lost its luster but may remove any patinas that have been applied. For brushed silver with no antiquing treatment, this is a great way to keep your piece looking new. The Jewellery Dip vs. Silver Dip. Silver dip will strip a patina off in an instant. They also have a tendency to dull your pieces. So beware. The only time I would recommend using a silver dip is if you have a heavily tarnished simple high polished silver piece with no patinas or stones. Even then, only a moment in the dip, any longer might actually be more hurtful than helpful to your piece. Jewellery dips on the other hand, are another story. There is quite a spectrum of them out there, and most of them are not nearly as strong as silver dips. Some seem not too much stronger than the soap and water option. Read the label carefully before using. I find the ones that are safe for porous stones and pearls are actually fairly safe for patinas too. Avon for example has a jewellery dip that did not strip my patinas. So if you have a tarnished piece that has been given special surface treatment like a patina that needs more than soap and water, I'd recommend a jewellery dip before a silver dip. And just like the silver dips, only keep your pieces in the jewellery dips for a moment or two. Don't forget to rinse and dry thoroughly! EASY AT HOME WAY TO REMOVE TARNISH FROM STERLING SILVER! This is a great, fast and easy way to clean up even very tarnished jewellery. Be very careful to watch the jewellery as it will change back quickly, and it can possibly remove intentionally tarnished (patinas) areas that might be in the details of you pieces, so pay close attention to these pieces! 1)Get a glass baking dish and cover the bottom with aluminum foil. 2) Pour steaming hot water (about an inch or however high you need to cover the jewellery) into the dish. 3) Add about a 1 tbsp of each salt and baking soda to the mixture. 4) Drop the silver pieces into the dish, make sure they are touching the foil, and not touching each other. 5) The tarnish will begin to disappear instantly, heavily tarnished items might require a few extra minutes. Watch the pieces, and when they look clean you can take them out. Rinse them off with water and dry thoroughly. They should be looking pretty spiffy now! You should try and take good care of all your jewellery, but especially if they contain stones or pearls! Pearls and porous stones such as turquoise can easily be damaged by chemicals in perfumes, skin lotion, and are softer so they are much more prone to abrasion then tougher stones. There are so many different and wonderful stones. Each of them is different. Some like jaspers for example are super tough. And others such as labradorite (pictured left) are hard, but they contain cleavage planes which the stone may break along if given a hard enough knock. 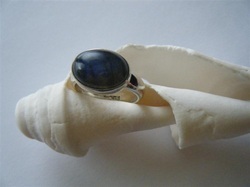 So if you have a special stone, find out about it so you can wear it properly and safely. For example, never wear your jewellery laying bricks. That's kind of an extreme though. A less extreme example would be to not wear your jewellery gardening. There is a lot of silica in dirt, and silica, which is basically quartz, will dull down your stones and silver if it's rubbing against them. This is super bad for any stones that are softer than quartz. Like amber for example. Digging around in the dirt with an amber ring will ruin it, guaranteed.